For a long time BALZER Edition rods have been convincing in both design and high end technology. BALZER designer team has succeeded in producing a genuine hit in terms of appearance. The symbiosis between the ruby-red, shimmering carbon surface and the gold colored elements has a superb, noble effect. The most recent Edition IM-12 generation is a true masterpiece thanks to its slender, well-made, lightweight TORAY ultra high modulus carbon blanks with actions as fast as arrows. The highly compressed Japanese IM-12 carbon-fiber blanks form the basis for these first-class rods. The spin rods impress with sturdy, strong and fast taper actions. The innovative FUJI reel seat of the put-in rods is open on both sides to enable one’s fingers to lay on the blanks while one is fishing. There is no other more sensitive bait detection and bait guidance to be had! This rod series it truly is the epitome of high end, high quality. 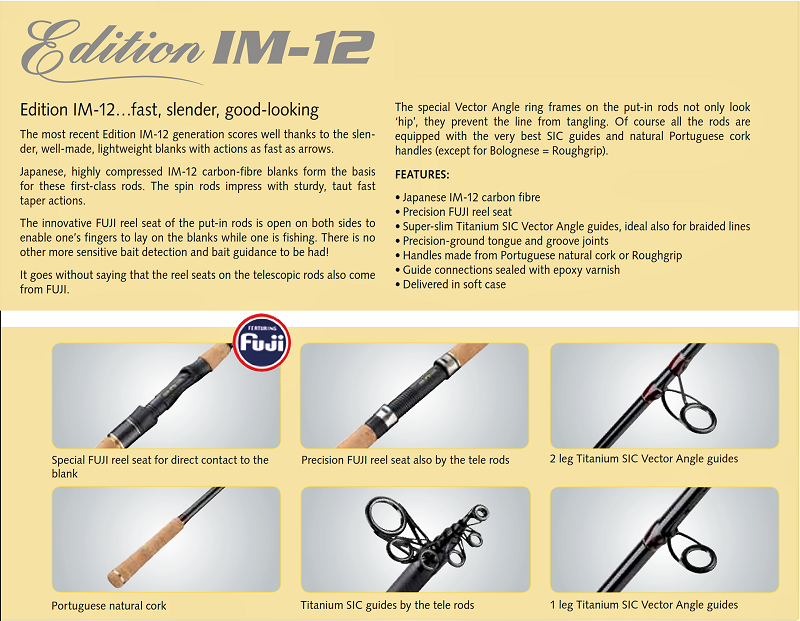 The EDITION IM-12 is BALZER's top-of-the-range rod series. The Ideal spin fishing rod for snapper and medium sized kingfish (rat kingfish) as well as big salmon, tailor, flathead, school mulloway or gummies. All kinds of artificial baits can be used. Anything from bigger plastics, grubs or shads to smaller metal jigs and 50-65g stickbaits. Works exceptionally well also for barramundi and Murray cod. The rod weighs only 190g! !